"I was watching a group of 96 Trumpeters last night when a group of about 200 whistlers* came in from the north; dropping down from over 10,000 feet elevation to 'howdy' Red Rock Lakes Refuge. No Cathedral could induce the awe of or love for our Creator that engulfed me as I watched, listened and felt." Trumpeter Swans and their haunting calls symbolize wilderness and freedom. Fifty years ago Trumpeters occurred in only a few limited areas and were highly vulnerable. The founding of The Trumpeter Swan Society in 1968 came about in response. Early on, prominent wildlife managers recognized how important it was to return swans to pre-settlement parts of their range and rebuild secure numbers. 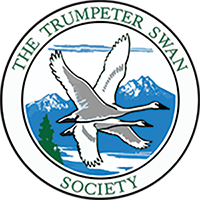 Strengthened by their vision, which included establishment of The Trumpeter Swan Society (TTSS), we continue their inspiring efforts to return the magnificent Trumpeter Swan to North America. The idea of restoring Trumpeter Swans to their native range in North America came about through a suggestion in the early 1960's made by Bob Burwell, U. S. Fish and Wildlife Service Regional Director in Minneapolis/St. Paul, Minnesota. At that time Bob suggested to Fred King, Chairman of Minnesota's Hennepin County Park Reserve Board of Commissioners, that restoration of Trumpeter Swans would help increase the visibility of the District's parks. Wildlife managers agreed that establishment of a separate population would make the species less vulnerable. In 1967, thoughts of restoration became reality as the first Trumpeter Swans were transferred from Red Rock Lakes National Wildlife Refuge, Montana, to be released in lakes and wetlands of Carver Park Reserve, Minnesota. Fred King, a banker by trade, an avid waterfowl hunter, and avid conservationist was the force behind the founding of TTSS and the restoration of Trumpeter Swans in Minnesota. King attributes formation of The Trumpeter Swan Society to his colleague Al Hochbaum of the Delta Waterfowl Research Station in Manitoba, Canada. Hochbaum had been a graduate student of Aldo Leopold at the University of Wisconsin. In a distinguished career, he went on to establish the Delta Research Station and authored two classic books about waterfowl biology: The Canvasback on a Prairie Marsh and Travels and Traditions of Waterfowl. At a meeting in Carver Park Reserve at the time of this historic restoration effort, Hochbaum suggested forming a group of professionals to assure the vitality and welfare of wild Trumpeter Swans. His suggestion received enthusiastic support of the others in attendance. Before the meeting was over, The Trumpeter Swan Society was founded. Fred King served as the Society's first President. Other founders, in addition to Fred King and Al Hochbaum, were Peter Ward of Delta Waterfowl Research Station, C. R. "Pink" Gutermuth of the Wildlife Management Institute, and Don Cochran, Cliff French, and Robley Hunt, all staff of the Hennepin County Park Reserve District. The list of Charter Members published in 1969 in the Society's first newsletter also included prominent waterfowl experts and conservation leaders of that period: John "Frosty" Anderson of the National Audubon Society; Winston Banko, former manager of Red Rock Lakes Refuge and author of the monograph, The Trumpeter Swan; Charles Bell, president and chairman of the board of General Mills; Walter Breckenridge, Director of the University of Minnesota's James Ford Bell Museum of Natural History; Clarence Cottam, former Assistant Director of the U. S. Bureau of Biological Survey (now the Fish and Wildlife Service) and Director of the Rob and Bessie Welder Wildlife Foundation; G. V. T. Matthews, British ornithologist; and Peter Scott, naturalist, artist, and founder of the Slimbridge Wildfowl and Wetlands Trust, later to become Sir Peter Scott. We can all be proud of the vision and dedication of our founders and the tremendous restoration progress that has been accomplished since 1968. TTSS remains uniquely positioned to merge the skills, dedication, and resources of private citizens and wildlife agencies in the continent-wide effort to restore this magnificent species. We invite you to join us and help keep swans secure in our rapidly changing world. Though they were small in number, our founders truly made a difference - so can we with your help! If you are not yet a member, please JOIN US today!